Today I spent the morning taking a homemade pasta cooking class. Yes, because I love pasta! 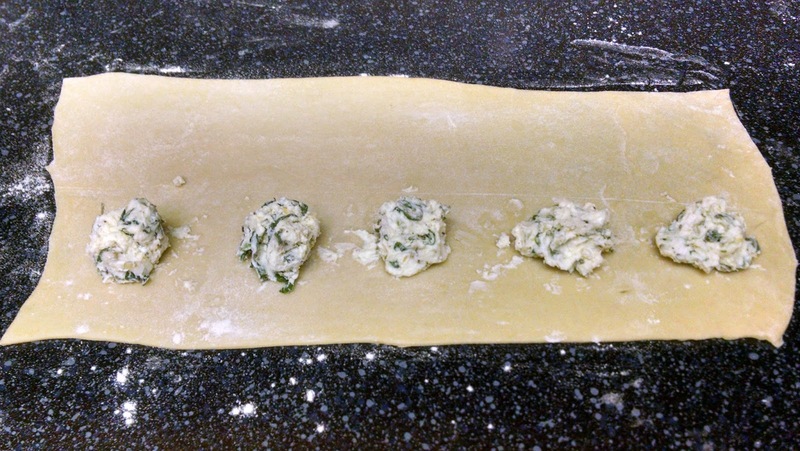 Alright, so homemade pasta is pretty easy and just requires some very basic ingredients. However, it can pose a challenge for an average home cook, but we aren’t your average home cooks. Having said that, I am going to break my pasta adventures up into a few posts since I am still working out a few details regarding the recipe(s). What pasta making adventures have I undertaken? I have made gnocchi and ravioli so far. I made the Garlic & Herb ravioli with a homemade tomato sauce, and it was spectacular! The gnocchi is ready, the only question is how we should enjoy these pillowy pieces of potato? Finally, I am continuing to refine the recipe on angel hair/spaghetti and fettuccine style pastas. I will share those just as soon as I have the details sorted out a bit more. Here is the ravioli in process before being covered with the top sheet of pasta. Looks amazing, right? Don’t you wish you could have some? Too bad, I only made 9 — just enough for two!